As I write I am so exhausted. I love what I do; do not get me wrong. I am just tired from the lack of sleep. I also don’t know if it is the heat, but I am not feeling too great. It is Father’s day in a couple of days and I had the intention of making something elaborate, but please how many men care about that? 🙂 I have brothers who can cook up a storm but they rather throw everything into one pot and cook away. Most of my culinary skills come from watching my folks cook. I wonder how my brother threw everything together in one pot and came out of the kitchen with a pot full of yumminess. 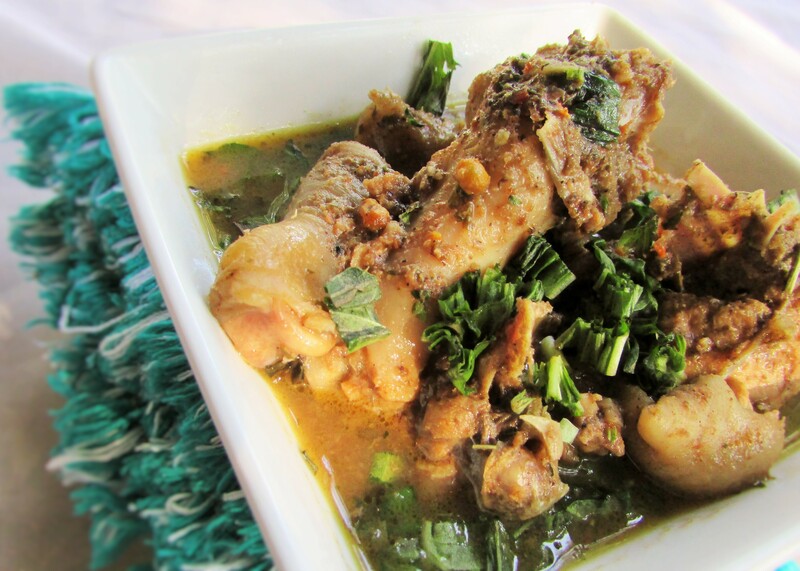 The Nigerian pepper soup; be it with chicken or with assorted meats is a huge Nigerian staple. It is a huge appetizer at Nigerian parties. There is no Nigerian party without pepper soup. Since Father’s day is in a few days, I would have rather cooked my father’s Egusi soup for this post, but that is one recipe I hold dear as my father passed away 15years ago. I felt a part of me died when he passed away. It was difficult understanding death and how to deal with it. When my father passed away, I did not cry and I did not understand why. It was years later when I had my first child, I began to really miss him. Don’t get me wrong, my father’s death was a huge shock to me. I don’t know how I bottled it up for years and one day while I carried my baby in my arms, I felt my body break into pieces. I cried until I almost fainted. Imagine, no father to carry my baby, to see my baby, to tell me that I will be okay. I have my good and bad days. I still have the days I cry, I have the days I smile, I have the days where I have to talk to myself, I have the days where I sit and wonder. It has not been an easy journey, but it has been okay. I always thought my dad was immortal. He believed in the education of women. I still remember how he used to whistle and dust his feet and knock the door and my siblings and I would scramble to keep the house neat. My dad taught me how to cook his version of Egusi(Melon seed) soup and gosh did I dislike cooking. Now his recipe is my everything…Funny how you hold on to people once they pass on. That is why I say always show love to everyone so they see your love while they are alive. My dad meant a lot to me…emotionally I am not all the way mended from his death. But one thing I could not do is forget you daddy. Back to the recipe 🙂 this is my Auntie’s way of making pepper soup. She used to add a whole lot to her pepper soups. She did the red bell pepper in it too, but I do chopped Basil i.e. scent leaves instead. There is a “Lazy” twist to this recipe. If you are one of those people who cannot be bothered to check the cooking pot each time, you could make it in the slow cooker. Trust me, pop it in the slow cooker with the ingredients and run all your errands, 5 hours later you will have your chicken pepper soup with the chicken falling off the bones. I slow cooked mine on the stove and my chicken was quite soft. If you do not own a slow cooker, the stove will surely work. Just bring to a boil and reduce the heat to simmer until the spices have mixed nicely. This is an easy recipe for you for “Daddy day” especially if Daddy wants something hearty and easy. You may serve it with rice or vegetables like peas and carrots. I always eat mine with bulgur, potatoes or vegetables since I am doing my best to be on team #fitfam. Making my pot was fun and the aftermath of the cooking was epic! Even my guest was too pleased and the whole pot was gone in a flash. Eureka! Cut chicken into desired pieces. Wash and pat dry. Blend all the ingredients from part a into a smooth paste. Season the chicken with salt and toss with the blended paste. Cover and let it sit for 30minutes to 12 hours. 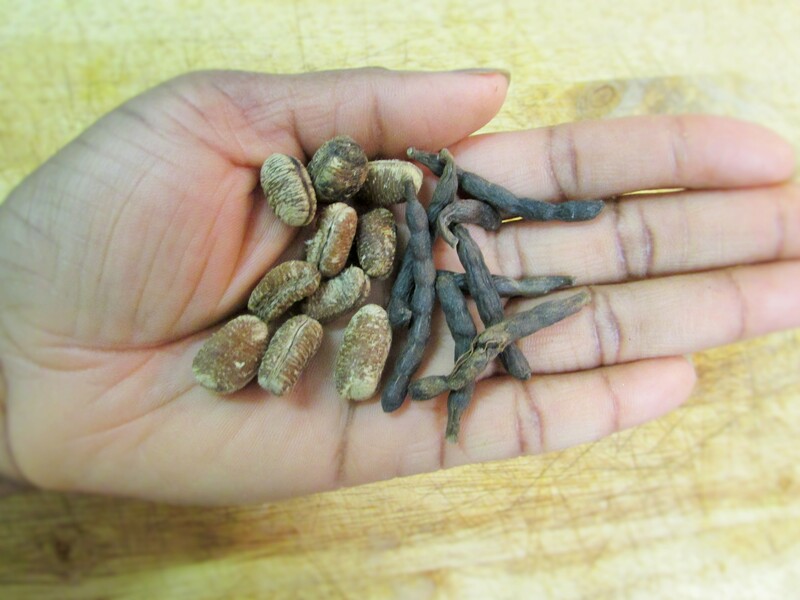 to toast ehuru, simply remove the seeds from the shells and toast like you would peanuts in a pan over heat. This entry was posted in Healthy Nigerian, Healthy Nigerian Dishes, Nigerian sauces, Nigerian soups, Pepper soup, Peppersoup, Soups, Uncategorized and tagged Chicken pepper soup recipe, Hot soup recipe, Nigerian chicken pepper soup recipe, Nigerian chicken soup recipe, Nigerian pepper soup recipe. I really love your recipe,it really helped me and am also sorry for the loss of your father. When I want to laugh through preparing a dish, I just come to your page. Sometimes you just read through me n write. Your recipes helps me every time am thinking of what to prepare for my customers. I hope to work with you someday.